This heat resistant material’s hardening is accomplished by a water and whipped mix instead of a plaster base. It happens by a reaction between metal rust and an ammonium’s salt. A percentage is made of silica. It is the right investment to pour high melting point metals and alloys, especially the chrome-cobalt alloys, by the “lost wax” procedure. It is used to fill the mould when pouring high melting point metals (chrome-cobalt alloys) refractory molds, or oven’s covering. 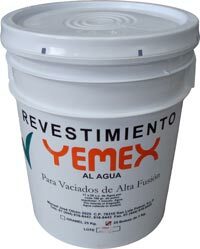 It is recommended to use a rate of 17 to 20 cc water with 100 g powder to obtain a thick and fluid mix that gives a good mechanical resistance to the final product. Of 5 to 15 minutes. Plastic can with hermetic seal containing 25 Kg packed in 1 Kg polyethylene bags. Card box containing 10 Kg packed in 1 Kg polyethylene bags. An acid reaction occurs when the material hardens, that’s why it’s used in the Dental Technique to obtain chromo-cobalt alloy’s castings, plus it is great as covering for certain type of ovens, as well as to make certain muflas, blocks and refractory molds. Copyright © 2009 Yesos Especializados de México S.A. de C.V. All rights reserved.